Portability Option, all instruments in the 4100 range are available in a rugged portable case for test and measurement applications where instruments need to be taken from place to place. 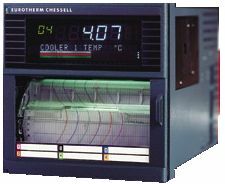 Eurotherm Chessell has an extensive family of strip chart recorders, ranging from one input, preconfigured units with an analog scale display, to recorders handling over ninety inputs with a range of advanced features including math capabilities and serial communications. The recorders are offered in three chart widths, 3.94” (100mm), 7.09” (180mm) and 9.84” (250mm), with both continuous pen and multipoint printer versions being available.